RCIN 1005115.j - Rama, the seventh incarnation of Vishnu. Rama, the seventh incarnation of Vishnu. 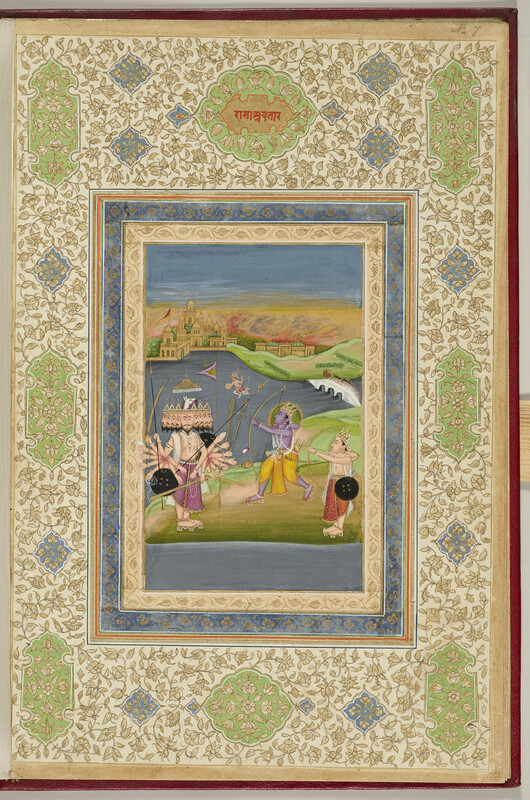 On the right, Rama, the seventh avatar of Vishnu, and his younger brother Lakshmana shoot arrows at the ten-headed Ravana, King of Lanka. Flying above them is the tiny figure of Hanuman, the monkey god. On the bridge is Hanuman's army of monkeys and bears beyond which is Sri Lanka where Ravana's palace fort is in flames.